The Taj Garage: Where HAS the time gone? So it’s been a bit quiet around here lately as not very much has been getting done building wise. The sad reality of the approaching winter has begun setting in, and it’s just been too wet to get anything productive done on site. 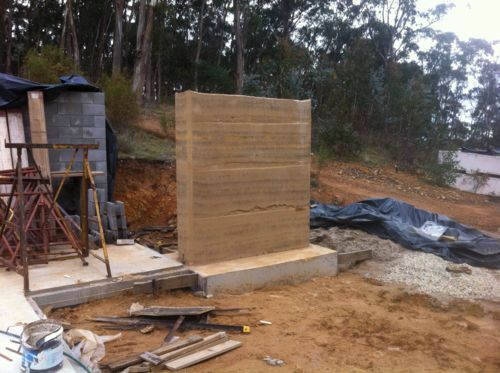 The test rammed earth wall has cured nicely in the humid (read: wet and miserable) weather. It hasn’t lost all of the black staining from the virgin formwork, but I think with a little attention I could get rid of it easily enough. The natural colouring of the local soil has come out nicely though, and I’m very happy with the end result. The Plasticure additive has worked brilliantly, too. While the ground around the site is sodden and mucky, the wall is literally bone dry even though it’s been exposed to all the weather. I didn’t get a photo, but the area I used to mix the batches is dry too, with little puddles of water pooling in the dry, hydrophobic soil below. Good stuff. One positive side effect of the hydrophobia which I hadn’t anticipated relates to the steel reinforcing mesh which will be encased inside the for-real wall. I had originally attempted to buy galvanised mesh to prevent “concrete cancer” (where the mesh rusts, expands and causes the wall to crack) but it’s not easily available off-the-shelf, and getting regular mesh galvanised costs a fortune. I had toyed with the idea of paying the boys a little pocket money to slap on cold-gal paint, but the Plasticure solves the problem entirely since no water can get anywhere near the steel mesh — so it isn’t going to rust, galvanised or not. Win! About all I was able to get done on site this past weekend was preparation for ramming the first wall panel. I haven’t been able to get a delivery of sand on-site due to the wet ground, but with any luck I can arrange that this week and get a wall panel done on Saturday. 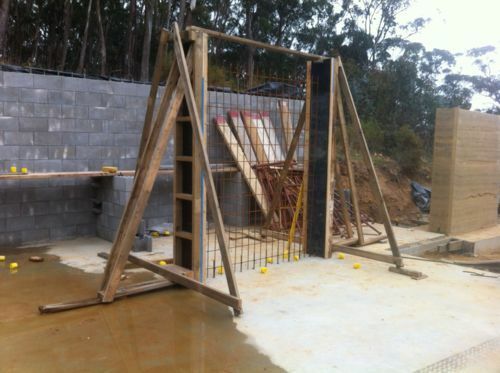 So, in preparation for that I’ve erected, plumbed and braced the first set of forms and reo mesh all ready for a building inspection on Friday.